A fascinating intermingling of philosophy and dramaturgy, both in the name of existential commitment. Though Sartre's fundamental concepts--liberty, situation, negation--are famous, their particular relevance to the plays he's been presenting since the Forties has always been cloudy. So it is good that a compilation of his theatrical reflections--mostly short essays, lectures, interviews--is now available. The knotty brilliance so formidable in Being and Nothingness or Saint Genet is absent, but the basic conflict is still the same: individual rights vs. "bourgeois morality." The bourgeois, of course, is the bugbear throughout, whether identified as fascism, materialism, capitalism, God, or Hugo, the "hero" of Dirty Hands, "a young bourgeois idealist who does not understand the imperatives of concrete action." With the staging of The Flies during the German occupation, Sartre sounded his general formula: immerse men in universal and extreme situations "which leave them only a couple of ways out, arrange things so that in choosing the way out they choose themselves, and you've won--the play is good." 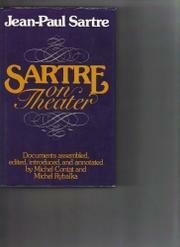 By the time of the Cold War, however, Sartre deserted metaphysical biases for political shibboleths, favoring a "people's theater" demystifying the hypocritical values of a class society and condemning "bourgeois theater"--including the dramas of Beckett and Ionesco which take for granted an unalterable "incommunicability" between men--as "reactionary." As can be seen, Sartre's arguments are not always coherent, but the book is important nevertheless.